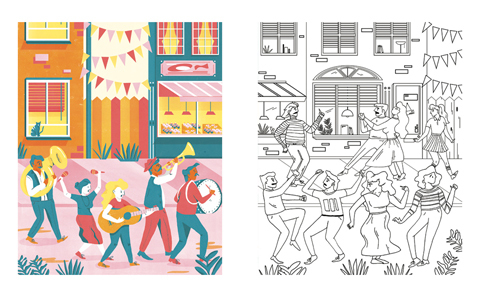 I’ve made a fabulous addition to the campaign in the form of A3 colouring print sets: 6 lucky artists from the book have been chosen for a publishing deal with East End Prints, who will produce high quality prints of their double pages: one full colour A3 print and one black line A3 print to colour in. 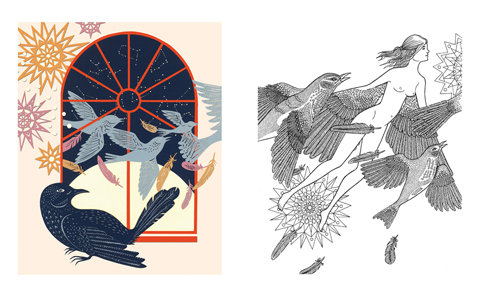 These beautiful prints can be displayed on the wall alone or as a spectacular diptych of your making! The twin sets will retail at £19.95 but we’re offering them at a special price of just £15 prior to their launch at the London Illustration Fair in December. Eleanor Percival by Steph Moulden. Artist Jenny Tang colouring in her page. 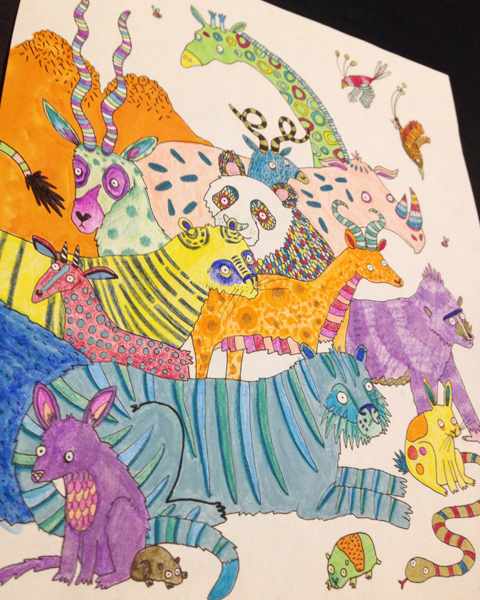 In other news, I’ve asked the artists featured in Amelia’s Colourful Colouring Companion to colour in each other’s artwork and the results have been so fantastic that I’m already cooking up ideas for an exhibition. 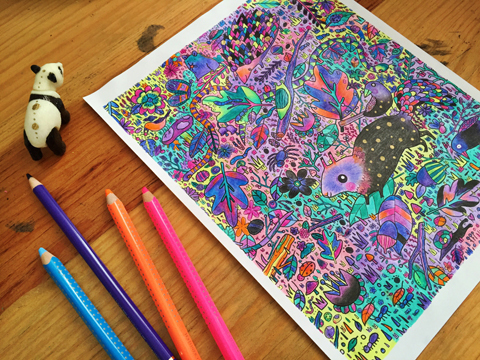 I hope these examples will whet your own colouring appetites and cannot wait to see what you do with your pages. 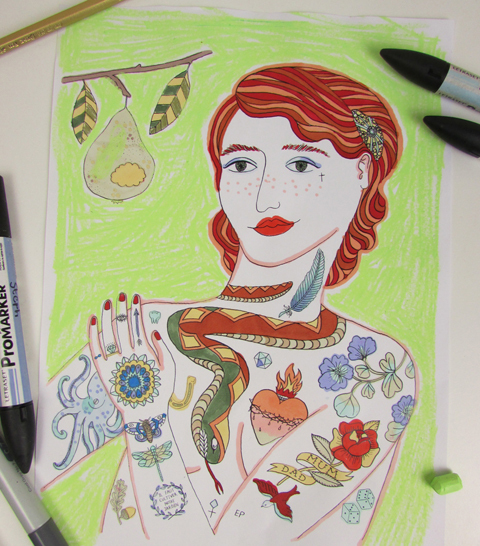 Get your copy of Amelia’s Colourful Colouring Companion from Kickstarter now! 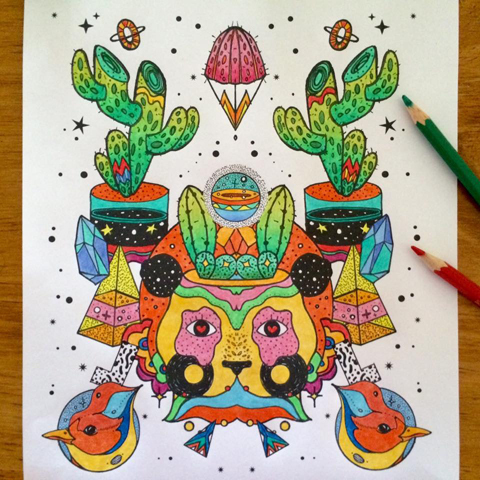 Top image by Sua Agape, coloured by Shannelle Schutz.